Climate change is one of those subjects that is awash with data, leading to an almost endless capacity for analysis and ultimately conclusion drawing. The same data can be used to create different analytical output and a single analysis can lead to more than one conclusion. This comes about not just from the climate data itself, but from energy use data, energy use projections and the combination of all of these into both simple and highly complex models which seek to map out climate scenarios for the balance of this century and beyond. A recent paper from Carnegie Institution, Stanford, CA looks at the differential climate impacts for the transition away from coal to various lower greenhouse gas energy systems, ranging from natural gas to hydro electricity. The authors modeled the temperature impact by 2100, based on a shift of 1 TW of coal generation capacity over the balance of this century. 1 TW was about the global coal capacity in 2000. Coal was picked as the base case because it is the most widespread method of generating electricity and is the most CO2 intense way of doing so. In the base case, warming from the continued use of 1 TW coal generation through to 2100 gives a temperature rise of 0.3°C. The paper clearly illustrates the transition challenge inherent within the energy system, both from the perspective of the time it takes to replace the existing infrastructure stock and the latency of CO2 in the atmosphere. As a result of this, even the complete switch off of 1 TW of coal through conservation in the medium term does not deliver a 100% benefit. It would take some time to achieve such conservation during which the coal plants continue to emit and that CO2 then remains in the atmosphere. 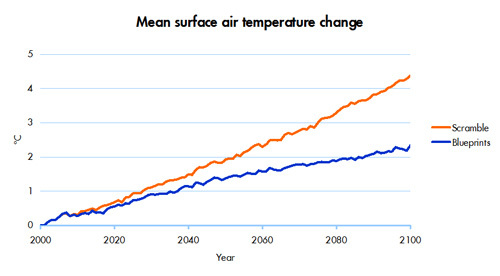 By 2100, the benefit is about 0.25°C out of a possible 0.3. Various other alternatives are also considered. Despite the lengthy time lags involved, delaying rollouts of low-carbon-emission energy technologies risks even greater harm in the second half of this century and beyond. This underscores the urgency in developing realistic plans for the rapid deployment of the lowest-GHG-emission electricity generation technologies. But one coal blogger came to a very different conclusion when reporting on this paper.
. . . . . studies such as this one, which recently appeared in Environmental Research Letters, which show the limited impact eliminating all coal-fired power generation would have, according to the study eliminating coal from the mix would only reduce global temperatures by 0.2 degrees over the next 100 years. Such a change would come at a massive economic and no doubt social cost, with no real change in climate outcomes. That post implies there is questionable benefit in tackling coal because of the claimed limited climate impact that results from doing so (0.2°C) and the potential high (but not quantified) cost of the transition, but it does not appear to account for the expected growth of coal use to three times the level used in the analysis (presumably a 0.9°C impact if we do nothing). The Carnegie analysis also assumed that the starting point was a new coal fleet, whereas the reality today is that nearly half the global coal fleet is quite old (particularly USA, EU, Australia) and therefore ready for replacement in the near term. Conclusions aside, the paper notes that “No previous study has predicted the climate effects of energy system transitions”. I don’t think that this is the case in that the 2008 Shell Scenarios which incorporate a major energy transition were modeled by MIT to show the climate impacts. I have shown the charts below several times in the past (including last week), but they clearly show that a substantive transition (Blueprints) can make a difference by the end of the century. What it also shows is that the transition will be very long and that we won’t really see the climate benefit until the second half of the century. Even then, the 2°C goal is missed in 2100, although the climate system is beginning to stabilize. When you find that you are digging your way into a hole, the first imperative is to stop digging. The graphic linked above clearly shows where coal consumption is increasing (where the hole is being dug) and where the first logical step in the control of coal emissions would have to occur (stopping the digging).